The N2O Program is a monthly day-trip to the Harrison Lewis Centre for those 55 and older, and their friends and family for short presentations and to take part in guided nature walks, hands-on activities, led discussions, and a lunch. THIS WEEK: Have you ever discovered an ancient “artifact” on the beach or in the ground? Would you like to learn about what you’ve found? 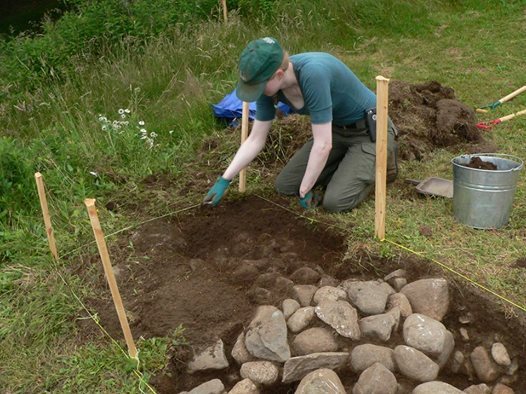 Archaeologists from the Canadian Museum of History and the Nova Scotia Museum are on the South Shore region of Nova Scotia searching for endangered archaeological sites, and you can help. Bring your found items to the Harrison Lewis Centre, in Port Joli, on Tuesday, August 22 from 10:00 a.m. to 2 p.m. An archaeologist will identify the object and tell you its approximate age. In return, they’ll photograph it and ask you where you found it. You’ll be helping them discover new archaeological sites, and may help them to preserve important sites endangered by climate change. Every Wednesday afternoon (1-3 pm) the Harrison Lewis Centre hosts Wild Wednesday guided nature walks at neighbouring Thomas Raddall Provincial Park. This week we'll have Mattew Betts from the N2O giving a short version of his presentation to the campers at Thomas Raddall! Come share the fun - rain or shine! These two hour walks are free. Just stop by the administration building at the park entrance to sign up and find out where each walk begins. All ages welcomed. Children under 12 must be accompanied by an adult. Unfortunately, we've had to cancel our Nature Photography Workshop due August 11-13. The HLC apologizes for any inconvenience. With luck, we will be able to offer a similar workshop next summer! Thank you to everyone who took part in our Backyard Forestry workshop this past weekend! It was amazing to have like-minded participants come in and share their experiences and their knowledge with each other. Every time we host a group I'm always awed by the inspiration and friendliness of the people that come by. Our friends and colleagues are truly some of the best! Our three instructors, Jaime Simpson, Donna Crossland, & Dale Prest, delivered a phenomenal two days of material. Jaime, originally from New Brunswick, is a forester, lawyer and published author. Forest ecologist Donna Crossland works for Parks Canada in Kejimkujik National Park, and is a brilliant, outspoken advocate for sustainable & healthy forestry practices. Dale Prest is part of Community Forest International (NB), has a Masters in Earth Sciences, and who's life goal is to simply be in the woods and spread the idea of forest carbon sequestration. Each of these presenters were incredibly knowledgable on all aspects of forestry and the ecology of those ecosystems. The topic of the weekend was managing personal woodlots, but as it turns out, there is much more to that then one would think. Not just how to do things, but why you should do them, and how they benefit the natural ecology of your forest. In Nova Scotia, 50% of our land is owned by the public on individual woodlots. Given this, the rural woodlots owners of the province have a lot of power in deciding the future of our forests. Learning why sustainable forestry practices are of utmost importance, not just in our province, but for the planet overall, can help woodlot owners make better choices with their land. The participants took part in lectures, outdoor field classes, and a roundtable with their forestry peers to discuss solutions to the current mismanagement of forestry in Nova Scotia. Overall, a surprisingly emotional learning experience, with lots of great food throughout. We look forward to next summers forestry workshops, and hope to have another group of passionate intelligent people take part! Be on the lookout for Level 2 Forestry Management Workshops! Intertidal doing research on the beach..
Our first weekend workshop is almost upon us, have you registered?! Don't cut off your toe to fill your woodbox; join us at the Harrison Lewis Centre Aug 18-20 for two days of learning how to operate a chainsaw properly and SAFELY. This hands-on course with certified instructor Patrick Allan covers all aspects of basic maintenance and safe use of this powerful tool. Saturday morning focuses on the saw’s engine, how it works and how to keep it tuned for top performance. Chain sharpening gets plenty of attention. Next the class moves outdoors to practice limbing, bucking, and notching in preparation for felling. Sunday participants move into the Harrison Lewis Centre’s woodlot where they learn-by-doing to drop trees where they want them to fall, plus the dos and don’ts of working with both downed and standing wood. You must bring your own chainsaw boots. All other safety gear can be provided. You are welcomed to bring your own saw, if you have one, as well as any of your own protective clothing, etc. 339 Sandy Bay Rd, East Port L'Hebert, NS B0T 1S0, or contact Dirk at 902-646-1554 for other inquiries! See more info on pricing under our Events page and to register! It's that time again! Wild Wednesdays are back for the summer! Starting next week on July 5th, the Harrison Lewis Centre will be hosting outdoor educational activities in Thomas Raddall Provincial Park. These are family programs, great for kids and parents alike! Join us in the park from 1-3pm (check in at the administration building) for a different activity every week. Next week we have our own summer student, Jake, leading us on a bird tour of the park! He'll be showing participants different bird species that nest in Thomas Raddall in the summer, and how to recognize their calls! Jake is doing research on this very topic during his time at the center and definitely knows his birds. But hurry; most birds stay for only a limited time in the summer. Catch this chance to learn about the birds that frequent Nova Scotia while they're here! Also, Wild Wednesdays are FREE! Hello! Two weeks ago the Harrison Lewis Centre had its first N2O: Never-2-Old workshop and it was a fantastic success! The theme of the day was self-sufficiency, recycling, and creativity! To incorporate these, we had participants make their own planter boxes using old fish tubs [donated by our neighboring fisherman on Wharf Rd], that they then planted herbs and different vegetables in. Voila, fresh veggies for the summer, and a major recycling project at the same time! These workshops can have up to 12 participants, so the instruction is much more personal, and the lovely folks we had come around for the first session had a great time getting to know each other while planting. The next N2O is this Tuesday, 10:00am-1:00pm, and the theme is Woven Nature! What does that entail you ask? Come on by to find out! Until then, enjoy the the sun and blue skys! As any birders out there may already know, the bay that the Harrison Lewis Centre resides in is home to an endangered bird species, the piping plover; The Nature Conservancy of Canada's Sandy Bay Nature Reserve is an area specifically made to protect their habitat. These birds usually end up in Thomas Raddall Provincial Park area, but occasionally hop over to our side of the beach, just to change things up. A sighting of any endangered species in the wilderness is a cause for celebration, but piping plovers are especially exciting. Or, at least that was the vibe I got from the 20-something ornithology students that were in the vicinity at the time of the sighting, all of which immediately sprinted down to the beach in the hopes of catching a glimpse. If you want to witness a stampede, come down to the centre during high bird migration and hang out with birders. In all actuality, the students of the ornithology class were clearly blessed by the "Great Raven" (birding joke), because the sighting took place just as they were packing up to ship out. There were two plovers spotted, hanging out on the beach, that stuck around until the students had got their fill of pictures and scope looks. A particularly steady-handed student was smart enough to take these pictures through the scope.These two plovers may have taken a liking to our side of the beach, as they were still in the vicinity early this morning, spotted again by our summer intern, Jake Hubner, during his morning bird walk. Let's hope they stick around! As always, if going into an endangered species habitat, you have to be careful. Plovers make their nests on the dry shore just above high tide, and by nest I mean they lay a couple eggs in a small divet in the ground. If walking along the beach on the ocean, try to stay in the "wet sand" if possible. These birds have taken a massive decline in population from a larger presence of feral cats and increased human expansion. Young plovers are hard to spot for the untrained eye; they blend in with the sand from far away and are quite small. Watch your feet! Especially in areas thought to contain nests. With a little knowledge and respect towards these adorable little puffballs, we might just be able to bring the plovers back! Summer 2017 Begins: Dalhousie Ornithology Class! The Harrison Lewis Centre has kicked off the Summer 2017 season with the completion of the annual Ornithology field trip! Students from Dalhousie, as well as some awesome TA's, and Sarah Gutowsky as the instructor, arrived last Friday. The class spent the last 6 days using the HLC as a base of operations while working in Sandy Bay Nature Reserve, as well as Thomas Raddall Provincial Park, and Kejimkujik Seaside National park. These areas are perfect for the avid birder, as this area of South Shore Port Joli, is home to a Canadian Wildlife Service migratory water fowl sanctuary, natural ecosystems, an endangered Piping Plover population, and many different bird species. South-west Nova Scotia is one of the best birding destinations in Canada; with the mixed woodlands, coastal salt marshes, & open ocean, there is a great diversity of species year-round. Which is why students come back year after year! We'd like to think that the HLC makes the experience even more enjoyable, providing camping areas, communal living space, and learning resources (as well as the company of a resident Labradoodle named Tank..). This year's class was an amazing group of truly phenomenal people; the energy throughout the week was constantly upbeat and full of companionship. Nothing brings people together like a passion for Class Aves! (Aka, birds) ...Or maybe it was having to share sleeping spaces, fight off bugs 24 hours a day, and the collective fear of running into a black bear in the middle of the night. Whatever it is that brings people together, it finds opportunity here. The staff at HLC are super grateful that such an awesome experience is made available to students, and that we can help provide it. More so, we're also thankful for the wonderful attitude of the students/instructors and the inclusiveness you showed; to each other as well as the interns here. We wish we had more time to hang out with such a rad group of people! March Newsletter - Announcing 2017 Calendar! Hello Friends of the Harrison Lewis Centre! We’re excited to announce the first of our 2017 weekend workshops. These include Birding by Ear, Chainsaw Use and Safety (including one for women only), Edible Wild, Backyard Forestry, and Nature Photography. For program descriptions, dates, and details, check our workshop page. There's more to come, so check back often. We’re offering early bird prices on all our workshops until May 1. Join us at Thomas Raddall Provincial Park every Wednesday 1-3 pm in July and August for an afternoon of guided nature walks. 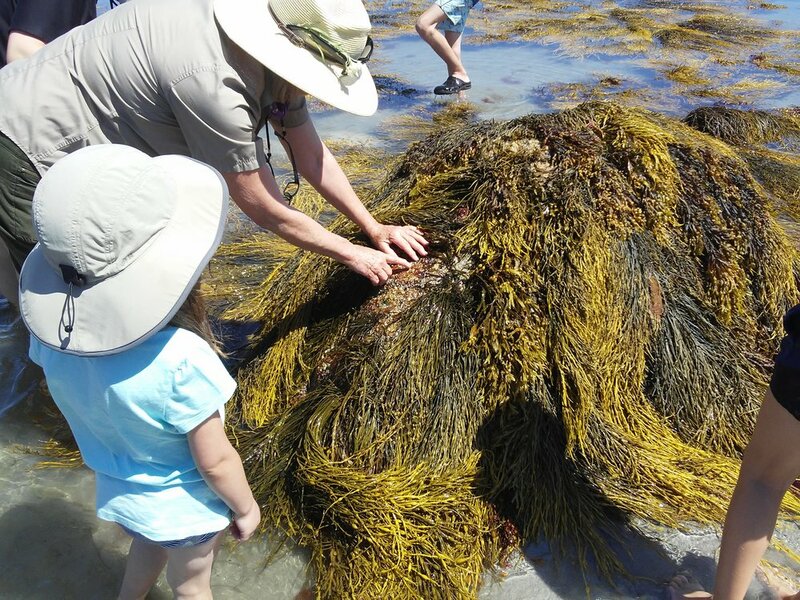 Now in its second year, the popular Wild Wednesday program brings together visitors of all ages to experience the natural history of this beautiful coastal park. Free! The N2O: Never-2-Old program is a monthly day-trip to the Harrison Lewis Centre for those 55 and older, their friends and family for short presentations and to take part in guided nature walks, hands-on activities, led discussions, and a lunch. Free! This initiative is made possible by the Community Fund for Canada’s 150th, a collaboration between the Harrison Lewis Coastal Discovery Centre, the Government of Canada, and extraordinary leaders from coast to coast to coast. Whether it’s an afternoon, a week, or a whole month, we’re looking for passionate and reliable people to help make this year spectacular! Do you have a skill or craft you’d like to share? Are you interested in connecting with an older crowd? Love working with children? Know your way around a kitchen? Landscaping or maintenance - there's always much to do. Fill out a volunteer information form or email thea@harrisonlewiscentre.org to find out more. In exchange for quality time on a beautiful South Shore beach, we are looking for two to four volunteers to help with workshops and other events at the Harrison Lewis Centre (harrisonlewiscentre.org) August 24-29, August 31-Sept. 4 (Labour Day Weekend), Sept. 8-12, and Sept. 22-25. Duties are primarily of a house-keeping nature as the Centre prepares for hosting students or researchers, looking after up to 24 people in-residence, and restoring the Centre to order after each of the groups leaves. Pick one weekend or all. Give us four hours of help each day and the rest of the time is yours to read a book, walk on the beach, appreciate the natural surroundings, or perhaps simply “cool out.” Your cabin in the woods promises restful nights. For board we offer groceries and a pick of the garden, along with access to a fully equipped kitchen in which to prepare your own meals. Be it for yoga, birding, music, or any other natural environment-related venture, the Harrison Lewis Centre offers the perfect locale for a retreat. Consider the Centre for a get-away this summer or fall on the beautiful South Shore. Sandy Bay is a remote, peaceful, forested location, on the ocean with sand beach frontage. We are across Port Joli bay from Keji Seaside Park. We have a main building for cooking, meeting, activities, etc., and a field laboratory. Individual cabins can accommodate four to five each for a total of up to 20 (more room for tenters). Check out the Harrison Lewis Centre website for lots of photos. Contact us for details. Special mid-week rates. Email hlc@eastlink.ca or phone 902-646-1554.